This Website is provided solely for the information of Cranston High School East Alumni and those who have a specific interest in the activities of this group. Any solicitation of business, information, contributions or other response from individuals listed in this publication by mail, telephone or other means is forbidden. Any individual can have their yearbook photo removed by contacting ernie_sutcliffe@chse1971.com. 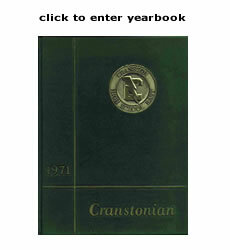 If you didn't get your photo in the original yearbook, in can be added now! Just send in a 1971 photo of yourself and we will put it in the electronic yearbook.